On Sports & Politics – Do Voters Simply “Root for Laundry”? Happy Memorial Day Weekend Friday loyal PLUS blog readers! The flipped perceptions on gas prices isn’t an aberration, said Dartmouth College political scientist Brendan Nyhan. On a range of issues, partisans seem partial to their political loyalties over the facts. When those loyalties demand changing their views of the facts, he said, partisans seem willing to throw even consistency overboard. 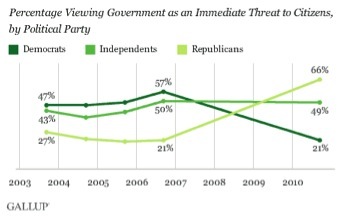 Seen another way, the graphic below shows the percentage of voters, by party, that view government as a threat. Note the relative consistency of the Independents line vs. the fluctuations in the Democrat and Republican lines. While PLUS blog is politically neutral, we do encourage you to read the entire post on Freakonomics over the coming 3-day weekend. Have a fantastic Memorial Day, and we’ll see you back here next week for a clip from the recent Medical PL Symposium on Tuesday and from yesterday’s webinar, FDIC Claims Against Directors & Officers of Failed Banks, on Thursday. Who is Making Money in the Current Market? In this clip from the 2012 PLUS D&O Symposium session entitled “Cross Fire” Evan Rosenberg (Chubb Specialty Insurance), William E. Dixon (AmWINS Brokerage of New Jersey, Inc.), Michael W. Smith (Chartis Insurance), Lou Ann Layton (Marsh USA), Michael Cavallaro, RPLU (ARC Excess & Surplus LLC) and Anthony G. Giacco (XL Professional Insurance) discuss who is really making money in the current market.